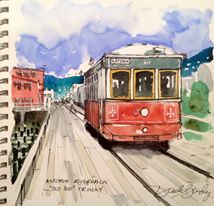 Join National AWS member Ron Stocke & Derek Gundy for a day of sketching around beautiful Astoria in Sketch Astoria. Ron D Stocke & Derek Gundy of Sketch Seattle travel to Astoria, Oregon for an amazing day of sketching June 4th, 2016. We’ll be hosted by Scott Leahing of Dots ‘N Doodles Art Supplies, a well known local art supp ly store that brings a lot of Art Education opportunities to Astoria locals throughout the year. Using them as our home base, we’ll have access to the waterfront, views of the bridge, and the heart of downtown. In 2013, Northwest artists Ron Stocke & Derek Gundy decided they wanted to collaborate on a special art educational project. In 2014, they created Sketch Seattle. They wanted it not only to inspire artists to sketch regularly, but also have it be one of the most powerful tools in their studio work as well. Locations have included Gas Works Park, Pioneer Square, Pike Place Market, Seattle Center, & Port Townsend, WA. In addition to adding Astoria, Oregon to their list, Ron & Derek also hope to begin in Portland, Oregon & San Francisco California in the future. The very first Sketch Astoria will be held Saturday June 4th, 2016. Cost is $85 for each student. The event features a full day of sketching instruction around key areas of Astoria, and we’ll be based out of Dots and Doodles Art Supplies at 303 Marine Drive. Our hosts Scott and Tim will help supply all students with the supplies they will need. Details will be released soon. Watch the video above to get a sense of how fun our workshops are! Our workshops sell out months in advance. We are now accepting registrations below. It is better to reserve a spot now than to be put on a waiting list later. Our cancellation policy is we always go rain or shine, if it rains we will have already scouted indoor venues where we can sketch, including Dots & Doodles. If we cancel the event, everyone receives a full refund. Any registered student may cancel outside of 30 days before a class and receive a full refund. 30 to 15 days before an event cancellation we issue 50% refund. We do not issue refunds for cancellations made 14 days or under before any class. This entry was posted in Dots 'N Doodles Event, Featured Event and tagged art drawing graphite.charcoal.pencil ink pen sketching. Bookmark the permalink.